I recently had an issue where a site seemed to suddenly stop communicating with it’s management point and the SUP. Whilst I never got to the bottom why it actually happened (given that all was working fine a day or two before) I did eventually get to the bottom of how to fix it but it took a good day out of a very busy schedule. 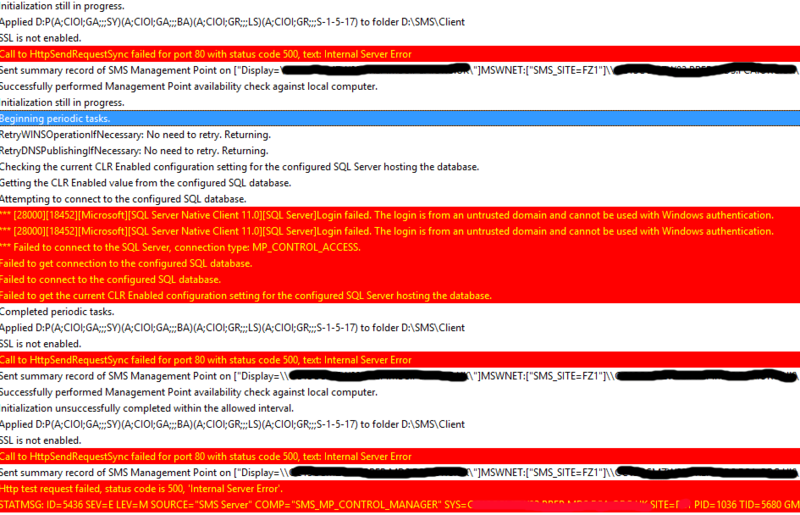 Anyway, the symptoms were an MP and SUP which could no longer communicate with the SQL DB. The logs would have errors similar to ‘Call to HttpSendRequestSync failed for port 80 with status code 500’. As you can see, what a mess. This was working fine previously! OK both logs looked better but we’re still stuck with errors. I decided to take a look back at the SPNs for SQL. I opened ADSIEDIT, found the SQL account in question and looked at the Service Principal Names registered. Sure enough they seemed to be registered with the NETBIOS and FQDNs all as expected. Balls. I was running out of ideas. After that everything started working again. I was happy. Hopefully this will help someone else frustrated with bugs they didn’t know of in SCCM and SPNs that look, for all intents and purposes, like they are otherwise registered. OneDrive For Business out of space – plenty of room left!